Many readers might assume that a book with the title The Voices Within would be a text about auditory hallucinations, which are almost always seen as negative symptoms of a mental illness. While the mental health experience of “hearing voices” is one element that the author describes, this book is much more expansive and covers many aspects of mental functioning. Fernyhough uses the term “voice hearers” to describe those individuals who hear a voice in their head as part of a variety of mental functions, many of which are neutral or potentially beneficial. Some voices are kindly, some are guiding, some are encouraging, and others are commanding. They may take on a moral tone or express elements of remembered experiences. Some, of course, are also frightening and critical. This scholarly elaboration by a psychologist who has spent his professional career examining the experiences of “voice hearers” will almost certainly enlarge the understanding of this phenomenon for most people. Prior to reading the various parameters of this phenomenon, people may not have questioned their hearing a voice at various times. It may have been seen as quite natural and normal and many people would not even question that other people likely have the same experience when in fact there is significant variability between individuals. In the process of examining the voices within our head, the author elaborates on the very act of thinking itself as it has evolved through time and as it evolves from childhood through adulthood. Many readers will find themselves asking “Do I do that?” and answering sometimes yes, and sometimes no. In the baseball batter’s box, on the golf tee or before a tennis serve do we hear a voice telling us how to perform the action best. When we read the written line, do we hear the text spoken in our heads? Is “inner speech” essential to certain phases of life? When we write, must we work in silence, so as not to interfere with an inner voice, which helps us plan our writing? Do creative individuals have more inner voices than others? What kind of voices do people hear? Some feel like they come from inside the person themselves, others come from a distinctly outside place. Some voices are recognizable, others are totally foreign to the person. Is voice hearing helpful or distressing and debilitating? Regardless, the author makes a strong case that it does not equate to madness. Do individuals who are deaf from birth, still hear inner voices and if so, what do they sound like? The author touches on these and many other questions in a scholarly and professional manner, while at the same time giving examples that support our underlying humanity. 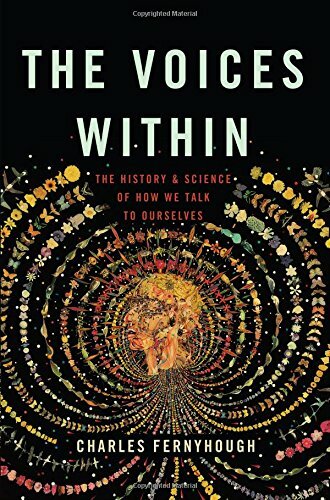 This is a book that will challenge some of our preconceptions about how we think and how “the voices within” may be plentiful, or infrequent, helpful or problematic and variable from person-to-person. This is a valuable book for those who want to understand one important aspect of our human mind.